The 2012 cotton harvest in Uzbekistan has concluded, and the system of forced labor of cotton production remained the same as in previous years. December 20, 2012, the Uzbek-German Forum for Human Rights and the Cotton Campaign released the Review of the 2012 Cotton Harvest, which explains that implementation of the forced labor system was carried out with a demographic shift to older children and more adults, accompanied with an unprecedented scale of corruption. increased extraction of financial and other resources from Uzbek citizens by government authorities. For the first time in many years, the majority of primary schools were not closed, reportedly under orders from Uzbekistan’s Prime Minister. However, forced labor of children as young as age 10 continued sporadically, and nationwide, children ages 15-17 were forced to pick cotton under threat of expulsion from school. “The demographic shift orchestrated by Tashkent during the 2012 cotton harvest indicated the government’s interest in allaying international pressure, but the continuation of the state-sponsored forced labor system of cotton harvesting evinced that the government has yet to make any progress in application of its national laws and international commitments on forced labor and the worst forms of child labor,” said Shin Young Chung, Attorney at Law, Advocates for Public Interest Law. 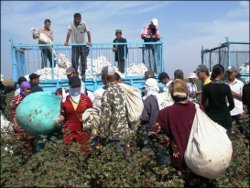 Throughout Uzbekistan, an estimated 16% of all government employees, including doctors, nurses and other essential service providers, were ordered to pick cotton under threat of losing their job, salary or benefits. Teachers were particularly targeted, with 60% of educators from each school sent out of the classrooms to pick cotton. “The 2012 cotton harvest was also characterized by unprecedented levels of corruption,” said Umida Niyazova, Director, Uzbek German Forum for Human Rights. Government authorities extorted payments from parents who attempted to protect their children, adults who could not meet their quotas, and local businessmen under threat of tax penalties. Unprecedented numbers of adults sent to pick cotton did not receive any payment for the cotton they picked. “What does it take for companies to take action to ensure that they are not complicit in the forced labor in Uzbekistan?” asked Dr. Mark Zirnsak, Uniting Church in Australia. The report highlights the human rights due diligence responsibilities of companies to prevent complicity in the Uzbek forced labor system, by eliminating Uzbek cotton from supply chains and, if operating in Uzbekistan, establishing independent monitoring and public reporting. The report Review of the 2012 Cotton Harvest is available on the websites of the Uzbek German Forum for Human Rights, here, and the Cotton Campaign, here: Review of the 2012 Cotton Harvest. The Cotton Campaign is the global coalition of worker, employer, investor and human rights organizations coalesced to build political will in the government of Uzbekistan to end forced labor of adults and children in its cotton sector. The Uzbek – German Forum for Human Rights (UGF) is a German based NGO aimed at improving the human rights situation in Uzbekistan and strengthening and promoting civil society, and a participant in the Cotton Campaign.